The Department of Family and Preventive Medicine (DFPM) was established in 1973 in the state’s only College of Medicine at the University of Arkansas for Medical Sciences (UAMS). The medical school is one of the six health colleges at UAMS. The Family Medical Center (FMC), conveniently located on the UAMS campus in central Little Rock, strives to provide the highest quality, yet cost effective primary healthcare to the community, while providing an environment that values teaching, scholarly activity, and research. True to the comprehensive and integrative approach of Family Medicine, our scope of services is wide: Preventive health, behavioral health, obstetrics and gynecology (ob/gyn), occupational medicine, geriatrics, adult and pediatric care, outpatient procedures, and more. Across Arkansas, the Area Health Education Centers (AHEC) Programs provide access to medical services for rural residents and education for healthcare students and professionals. This combination of service and education improves the health for rural Arkansans while also providing needed experience and training. The initial AHEC Program was started in 1973 through the combined efforts of then Governor Dale Bumpers, the Arkansas State Legislature and the University of Arkansas for Medical Sciences (UAMS). The AHEC Programs serve as the main educational outreach effort of UAMS, preparing physicians and healthcare professionals to serve in rural areas. The programs offer training for family medicine residents and students in medicine, nursing, pharmacy and some fields of allied health, as well as continuing education for medical professionals. The AHECs also provide information and programs about health careers to ensure an adequate future workforce for the state. The AHEC Programs provide access to healthcare and health education for community members in rural and under-served areas. Barriers to quality medical care for rural residents are decreased when primary care is accessible in their communities. 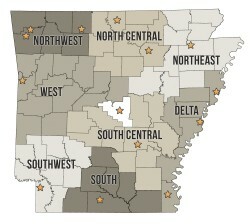 There are 8 AHEC Programs across Arkansas, each responsible for a specific region of the state. Each program serves as a training site for students and covers multiple counties. You can use the links below to find out more information about the AHEC program near your community.